We have a lot of very creative and talented customers who use our beautiful lumber to create amazing things. This page contains some of the work that our friends have shared with us. We hope you enjoy them! Keep in mind, we provide fine lumber for our customers creations. We do not build these items. We are constantly hearing from people who are using our beautiful lumber in unexpected ways, and this is another example. This Pecky Cypress log slice found its way into the Minnesota workshop of a Master Woodworker. We were so pleased when he sent us this photo. We think the beauty lies in its simplicity and that he truly showcased the amazing beauty of the Pecky patterning! Not long ago our good friends bought an unfinished Sinker Cypress slab table and bench set from us. They lovingly prepared and finished the pieces themselves and then sent us photos of their work. We think you’ll agree that they did a fantastic job and the set turned out beautifully! Our friends in New Jersey decided to join the Glow Table craze but do it with a twist – they created a Glow Bar! This bar is incredible with bright green glowing sections laid into the unique Pecky “holes.” They used two slabs of Pecky Sinker Cypress for this one-of-a-kind outdoor bar. We’re sure that once the word is out, they’ll be having many gatherings around that bar. We want to thank our friends and customers for sharing their beautiful creations with us! Make sure you check out the Glow Table with the step-by-step photos that another customer created and shared with us! 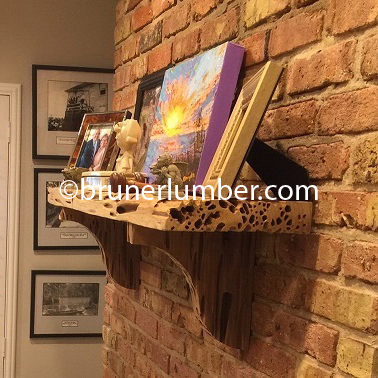 Our friend Tom sent us some photos of a beautiful Pecky Sinker Cypress mantel with Pecky corbels he has in his office. Tom spent quite a bit of time cleaning, sanding, and finishing his mantel and we think he did a great job! This is a perfect example of how the unique beauty of Pecky Sinker Cypress can transform an ordinary mantel into a showpiece! A big thank you to Tom for sharing his creation with us! Be sure to visit our Mantelpieces page as well as our Corbels and Brackets page for more photos and information. Recently our good friend Gregg created this Pecky Cypress shelving unit. The unique characteristics of Pecky Cypress make this a one-of-a-kind shelf or bookcase! We’d like to thank Gregg for sharing this beautiful creation with us! If you’d like more information about this kind of lumber, visit our Pecky Sinker Cypress page. Standing Cypress is “new growth” timber which has been recently harvested, as opposed to Sinker Cypress which was harvested a hundred or more years ago and then sat under water until it was “reclaimed” again. This beautiful dining table was made from an unusually large Standing Cypress log. The resulting slab was perfect for a gift of an outdoor dining table for friends of ours. We want to send Bev and Greg wonderful birthday wishes and hope they enjoy their new Cypress table! This type of Standing Cypress is often referred to as Tidewater Cypress. If you’d like more information about this kind of lumber, visit our Tidewater Cypress page. One of our customers built and finished this gorgeous table himself! He uses it for dining on his outside deck, and we think he did a fabulous job! It looks like a wonderful place to spend time with family and friends. We want to thank Gary for sending this picture of his beautiful Sinker Cypress table! Be sure to check out our Sinker Wood Tables page for more table ideas! One of our friends found this stump while he was out one day. He cleaned it up and then did a beautiful job of finishing it. We appreciate him sharing his before and after photos with us so that we can share them with you. 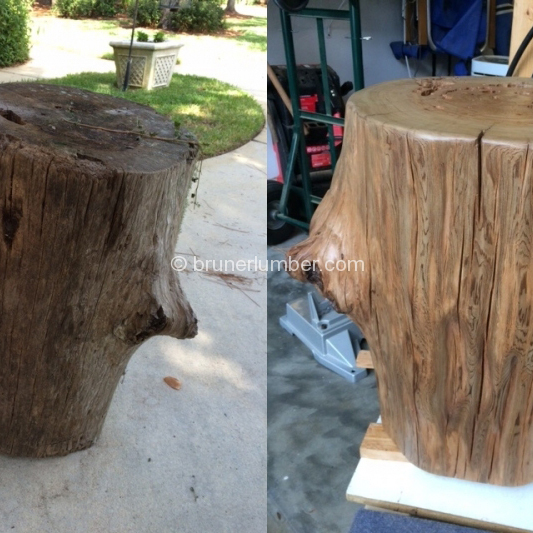 Be sure to take a look at our Cypress & Pine Stumps page for more info and pictures about our stumps! Remember, if you’ve created something special with our remarkable lumber, we’d love for you to let us know about it! Maybe we’ll feature it here in our “More Cypress & Pine Creations” area!